Particularly: Finish the infobox. Also, can Rock Pikmin defeat it? Specify in the opening paragraphs. The Spiny Coppeller (トビトゲムシ?, lit. 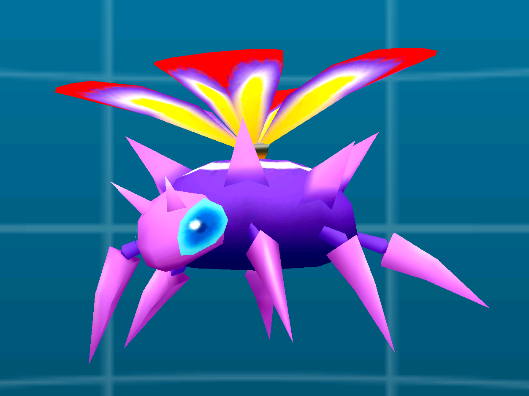 : "Flying Spiny Bug") is an enemy in Hey! Pikmin. It is a purple and, as the name would imply, spiked version of the Coppeller. It acts the same as the regular Coppeller as well, except it cannot be defeated by Pikmin, since any that touch its body get stabbed and killed. A Spiny Coppeller in the Creature Log. A swarm of Spiny Coppellers. This page was last edited on March 30, 2019, at 05:44.